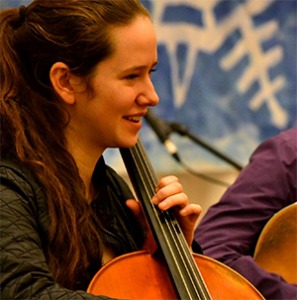 McKinley James is a cellist studying at New England Conservatory. After years with the Vermont Youth Orchestra, she joined the Boston Youth Symphony, and then the premier youth orchestra led by Ben Zander, the Boston Philharmonic Youth Orchestra. With the BPYO, she toured Europe twice, playing in concert halls such as the Berlin Philharmonie and at the Alhambra in Spain. She has also played with the Portsmouth Symphony Orchestra, Middlebury College Orchestra, and the New England Conservatory Symphony, she also soloed with the Champlain Philharmonic Orchestra. She was principal of the Vermont All State Orchestra sophomore year and won the All States Scholarship that year. She now studies with Yeesun Kim at the New England Conservatory. She is a founding member of the band Night Tree, that won the New England Conservatory’s Honors Ensemble. Together they have toured throughout the US, opened for Solas in Portsmouth Music Hall, and played in Jordan Hall and Rockwood Music Hall. They released their debut album produced by Seamus Egan, in 2017 and are touring in Europe in 2018.